This fascinating and well-written non-fiction book explores how the brokers and manipulators of “big data” affect us all, often in harmful ways. The author is a former math professor, Wall Street quant, and now is a full-time “Data Scientist,” a title she gave herself. She definitely has a great deal of inside knowledge about the users of big data and the algorithms they use to churn through the data and direct their activities. She calls them Weapons of Math Destruction or WMDs. Among the users are banks, credit companies, employers, government agencies, universities, advertisers, search engines, police departments, payday lenders, criminal sentencing courts, and insurance agencies. She gives an example of a teacher in Washington, D.C. who was fired because a WMD identified her as being in the worst 10% of teachers despite having had glowing reviews in the current year and top scores in previous years. It turns out that the teacher who had taught most of her students the previous year had corrected the standardized tests of her students to make it look like they were performing better than they actually were. The result was that their scores on the test dropped during the next year even though they actually made good progress. The cheater kept her job, while the honest teacher lost hers. Another surprising area to me was how the U.S. News rankings of colleges and universities has driven up tuition, lowered the quality of faculties, and actually made it harder for some top students to get into a “safety” school. You’ll have to read the book to understand how this happens. Many such tidbits are set forth throughout the book. The book has a definite political slant to it. The author decries unfairness in general, which I consider apolitical, but then tends to harangue on anything she sees as racial inequality or “targeting the poor.” Many WMDs take into account such things as Zip codes or credit scores, things she considers “proxies” for race. From the viewpoint of a civil libertarian, this is a valid approach, but, as she herself admits, from a business standpoint, some of these WMDs are effective at reducing inefficiencies and increasing profits. Corporations, banks, and even many government agencies are not in the business of fairness or eliminating racial inequality; they’re in the business of business, i.e. making money, or in the case of the government agencies, accomplishing an important task like public safety or building infrastructure at a reasonable cost. One could argue that they have a legal and moral duty, a fiduciary responsibility toward stockholders or taxpayers, to increase those profits or efficiencies. As she also admits, using traditional human judgment alone, without the WMDs, has its own history of unfairness and racial prejudice. A central theme throughout the book that was not explicitly stated is the failure of nearly all the WMDs to take into account the effect they themselves have on human behavior. Take the mortgage crisis of 2007-2008, for example. The math behind the collateralized debt obligations (CDOs) that packaged sub-prime mortgages with other debts was valid. If borrowers had continued to behave as they had statistically in the past, defaulting at the same rate, the CDOs would have been sound investments. What the lenders and brokers did not factor in was that once the market was created for these securities, lenders and borrowers would both change their behavior, increasing the number of mortgages granted to people who obviously had no way to repay them, thus changing the long-standing statistics on which the WMD was based. If you want to know how to increase your chances of getting hired or how to get a better college education at a lower cost, this book is worth your time studying. I don’t have any skin in the game, but I found it a very interesting read even so. This entry was posted in Uncategorized on April 30, 2017 by Russ. The map on the left has been circulated quite a bit recently, showing that electric vehicles (EVs) have been doing well in certain states like California, Texas, and New York. That map is misleading, however. Of course states with large populations and large numbers of cars registered are going to have more EVs. The one on the right shows which states have the highest rate of EV adoption based on the percentage of the vehicles in the state that are EVs, a better indication of how EVs have caught on. While many similarities exist between the two maps, it becomes evident from the second chart that states like Hawaii, Vermont, and Nevada are actually among leaders in adopting EVs. Georgia, with its strong state incentive program, now leads the nation in current sales of EVs as a percent, although California still leads in overall percentage registered. Sources: Energy.gov, CleanTechnica.gov, USEIA. Data is from 2014, the most recent I could find. This entry was posted in Uncategorized on April 27, 2017 by Russ. This graphic illustrates the percent of the vote total Donald Trump received from each state (top map) and the average SAT score of entering freshman for each state’s flagship public university. Both were obtained from data published by the responsible state officials (for the vote totals) and by the universities (normalized for the new (2016) SAT scoring system). 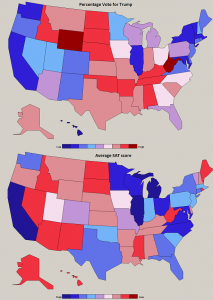 The darkest red in the top map represents the highest vote percent for Donald Trump and in the lower map, it means the lowest average SAT score. Note that blue (top) represents all non-Trump votes, not necessarily a vote for Clinton, since in some states (e.g. Utah) third party candidates received significant votes. The universities selected were the premier public university in the state, excluding specialty schools such as engineering or arts. The District of Columbia had no qualifying universities since all the public universities were specialty schools (e.g. military/intelligence). I just discovered the Polygons method in Delphi yesterday, so now I have a new toy to play with. 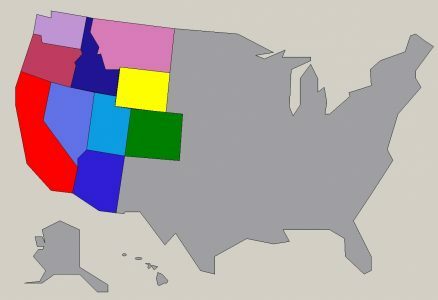 I’m working on creating my own USA state-by-state map. 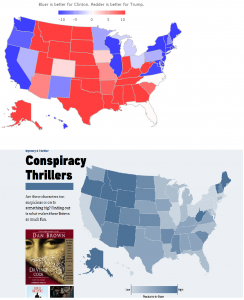 You can expect to be inundated with maps showing all sorts of possibly meaningless correlations. There’s probably some freeware out there that does the same thing, but that wouldn’t be as much fun and there’s always a hangup of some kind with that stuff. Here’s my work in progress. This entry was posted in Uncategorized on April 21, 2017 by Russ. I’ve lowered the Kindle price on all the Cliff Knowles novels, including all the overseas markets (except where it was already the lowest permitted price). Amazon does not permit a lower price except for very limited promotional days. The U.S. price for all of them is now $2.99 and if you have Amazon Prime, which I’ve read is now subscribed to by more than 50% of American households, you can borrow it for free. You get a one free book download a month. If you have Kindle Unlimited, you also have all the free downloads you want. All the books are available there, too. You don’t need a Kindle device – there are free apps for all the desktop and mobile devices in common use, I believe. See my Cliff Knowles Mysteries page for descriptions and links. I like the concept of this cozy mystery since I am a crossword fan and constructor as well as big mystery fan and writer, but I think it could be done better. Solving the crossword or the Sudoku won’t help solve the mystery, which was a disappointment. I found the main character, the so-called Puzzle Lady, to be irritating and unlikable. The main appeal for fans, I suppose, is the dialogue, but I found it forced and distracting from what I hoped would be an actual mystery plot. It turned out there was no actual plot. The Puzzle Lady’s outrageous personality and (snappy?) dialogue is the whole thing. You either like it or you don’t. This entry was posted in Uncategorized on April 10, 2017 by Russ. I recently received an email from Audible.com with a graph showing where various genres of books are most popular. I thought the pattern looked familiar for one of them. The top graph shows the percentage vote for Trump; the bottom shows the relative popularity of conspiracy books. Please share, retweet and all that. This entry was posted in Uncategorized on April 3, 2017 by Russ. Length scoring: I’ve found this to be a quite effective improvement to tetragram scoring, although they can be used together. Like tetragram scoring it has the advantage of not requiring any additional programming on individual ciphertexts, but unlike tetragram scoring, it does use up a bit of extra run time. It solves the problem I just mentioned in the previous paragraph. What I do is run the crib down the decryption and in each spot count the number of letters that are in the same place in both crib and decrypt. In the example above hisbeard and hixbeaqd have six letters in common. I then take the highest-scoring instance for the length of a decryption, 6 in this example. I typically take that number, subtract 3 (assuming it is at least 3), and square the result, then add that to my score. In this example it would add 9 points (6-3 squared) to the score, the equivalent of a high-scoring tetragram. I use this method mostly on cipher types that have longer cribs. It has a good ability to hold hillclimbers close when they get close. It works well with a wide variety of cipher types, but not as well on transposition types or combination tramp/sub types like Bazeries or Myszkowskis. Those types may have the crib letters in close proximity to each other, but not in the right order, or with an extra letter or two between. I’ve considered writing something that will give extra points for those situations, but I haven’t been industrious enough to do that yet. I think it’s worthwhile to follow a more typical example than what I used above. Let’s take AC-1159 in the MA2017 issue, a 6×6 Seriated Playfair. The crib is SELSEWHERETOESTAB. Clearly we can safely extend that to SELSEWHERETOESTABLISH, a crib of length 21. This method works better with longer cribs. Seriated Playfairs are not ideal types to use. As long as you have the correct seriation period, a trial decrypt that is getting close to the correct solution will usually have some crib crib letters in their correct relative positions, however, this cipher type inserts extra X’s to avoid doubles so the crib and correct decryption may not match. Since I happen to know the crib does fit exactly in this case, I will use it. Now the point of this crib method is to identify a trial solution that has a section that “looks like” the crib, i.e. is more like the crib than random chance would dictate, and then boost the score of that trial decrypt in an amount relative to the degree it departs from random chance (and is thus likely to be generated by the crib) . First we need to establish what random chance would dictate, since we don’t want to boost the score of a trial decrypt that shows some similarity to the crib here and there by chance. Since the index of coincidence in English is around 7%, random chance would dictate that if you compare the crib to any trial decrypt that is close to English in its index of coincidence and letter frequencies, 7% of the crib letters are going to match the decrypt letters. For this 21-letter crib, that’s about two letters. Of course this is only an average. Some will hit three, four or even more letters by random chance while in other cases there will be no matches. Bear in mind that, assuming we haven’t placed the crib by other means, we are not testing the crib in just one spot. We are running the crib through the entire trial decrypt and using the highest scoring spot. We don’t care how well the crib fits lots of different spots, but whether there is one spot where it really strongly seems to fit. Since the length of this con ct is 190 characters, that’s 190-21 or 169 comparisons. The question thus arises, given random variation, what can we expect the maximum number of letter matches to be by random chance in 163 trials? We need that to establish a baseline number. There’s no doubt a way to do this using the index of coincidence, lengths, and known probability formulas, but for me it’s easier just to write a program that tests this. My somewhat limited testing indicates that for a ct and crib of this length, random chance will produce a best fit for the crib of 5 or 6 letters even if the crib is totally unrelated to the correct plaintext. So a positive result is really only indicated if your test shows seven or more letters that match the crib in the best spot, and even seven is within the range of normal. The shorter the crib and shorter the trial decrypt being tested, the smaller that number will be. Since most cribs and ACA cons are shorter than this example, I use normally 3 as my baseline since I don’t have a chart or formula that applies to all crib and ct lengths. Even though testing shows 6 is probably a better number to use for this con, let’s examine it using my normal 3. The way I use this to score a trial decrypt is with a routine called CribFit that runs the crib along the trial decrypt and in each possible spot measures the number of letters that match crib with decrypt. I find the maximum number for that decrypt, let’s assume this placement: “qelmnuharptorrtingise”, which produces 9 letter matches with the crib. Subtract the baseline number of 3, and square the difference. Here 9-3=6 so that would add 6×6 or 36 points to my score, a significant enough number to influence the hill-climbing function. So even though “qelmnuharptorrtingise” does not look to the eye like a good crib fit, the computer recognizes it as one. If 10 letters matched the score would increase by 49 points, and 11 would produce 64. As you can see, the change in decrypt score really starts changing a lot as a long crib appears in the decrypt. This entry was posted in Uncategorized on April 1, 2017 by Russ.